Bacterial exopolysaccharides (EPS) play a critical role in sequestration of metals from contaminated environment. 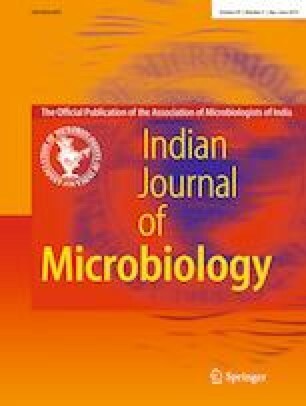 Considering these, this study was aimed at extracting EPS from metal tolerant Pseudomonas aeruginosa CPSB1 and Azotobacter chroococcum CAZ3 and to ascertain its role in metal removal. P. aeruginosa CPSB1 and A. chroococcum CAZ3 secreted 1306.7 and 1660 µg mL−1 EPS, respectively in the presence of 200 and 100 µg mL−1 Pb, respectively with glucose as C source. The binding of metal ions to bacterial EPS was validated by SEM and EDX. The functional group involved in metal chelation was revealed by FT-IR. The metal ions were adsorbed onto EPS and hence, EPS could play a crucial role in metal detoxification. Due to this novel trait, P. aeruginosa CPSB1 and A. chroococcum CAZ3 could be developed as bioinoculant to cleanup metal contaminated sites. The funding for this work was provided by Department of Science and Technology, New Delhi, India as INSPIRE fellowship (DST/INSPIRE Fellowship/2014/IF140773). One of the authors AR is highly thankful to University Sophisticated Instruments Facility (USIF), Aligarh Muslim University, Aligarh and Macrogen Inc., Seoul, South Korea for the analyses.